Definition at line 38 of file certificate_db.h. Definition at line 99 of file certificate_db.cc. 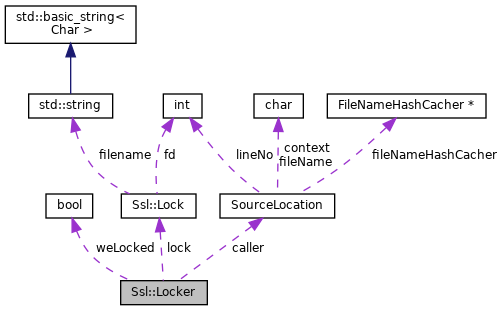 References Ssl::Lock::lock(), lock, Ssl::Lock::locked(), and weLocked. Definition at line 108 of file certificate_db.cc. References lock, Ssl::Lock::unlock(), and weLocked. Definition at line 48 of file certificate_db.h. Definition at line 49 of file certificate_db.h. Definition at line 47 of file certificate_db.h. Referenced by Locker(), and ~Locker(). Definition at line 46 of file certificate_db.h.